When the IZOD INDYCAR Series kicks off their first of two races of a 2011 Canadian visit, the Honda Indy of Toronto is the one time of the year where a different, more unbridled kind of speed awakes the roads around the Canadian National Exhibition grounds. In the feature event Sunday, the main attention turns to 26 purpose-built Dallara open wheel racing machines. Propelled by 600 horsespower Honda V-8 engines, the vehicles of the IZOD INDYCAR Series will command respect through rhythms roaring in the air over Lake Ontario and pulsation of the pavement. Drivers like Dario Franchitti and Will Power engage in competition within a field of veteran and series rookies for 85 laps. A completely unique sight, the 2011 Honda Indy of Toronto will feature a one more rookie of the automotive variety thanks to the event's title sponsor. 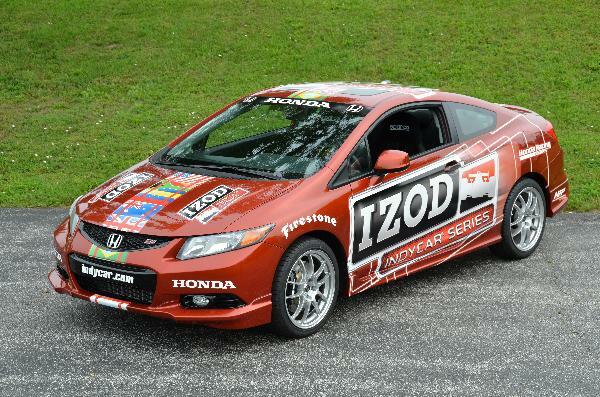 In the latest support of the IZOD INDYCAR Series, Honda has outfitted a new ninth-generation, Si-trimmed Civic Coupe for Safety Car duties in the North American open wheel racing series. Decorated with special colours and exclusive livery, the 2012 Honda Civic Si Coupe is given a moderate accessorizing to best quality itself for on track activities. Starting with some exterior improvements, Honda Genuine Accessory sourced a body kit featuring a sportier front and rear skirt. As the body kit mostly complements the aesthetics, Honda Racing Development gave the 2012 Honda Civic Coupe some more aggressive braking hardware. When applied, four-piston brake calipers on every wheel presses racing pads against competition rotors. Completed with stainless steel brake lines, the 2012 Honda Civic Si Coupe INDYCAR Safety Car has the ability to react during the extreme duties of policing much faster race cars. A considerably-modified vehicle, it may be surprising to note that some IZOD INDYCAR Safety Car's exterior parts are actually within reach by the general consumer through participating dealerships. With stopping power upgraded, Honda Racing Development also made some enhancements to the 2.4 liter i-VTEC engine. No specifics were divulged on how much more output the 2012 Civic Si powerplant was tuned to produce beyond the stock 201 horsepower mark. Throughout first pace laps the 2012 Honda Civic Si will govern, grippy Firestone Firehawk cars will roll on 18-inch Enkei alloy wheels. Driven by three-time Indianapolis 500 winner and official INDYCAR driver Johnny Rutherford for the first time on Sunday around the 1.765 miles, 11-turn temporary street course, the proven professional will find a well-appointed 'office' inside of the 2012 Honda Civic. Sparco racing seats with four-point safety harnesses are found inside the mostly factory interior. Making its premiere at the IZOD INDYCAR Series round in Toronto for Safety Car service through the rest of the season, it is fitting that the special 2012 Honda Civic Si Coupe debuts this weekend. For the North American market, one of two origins for the 2012 Honda Civic (excluding the Civic Hybrid models) is the Alliston, Ontario plant less than an hour down the highway from Toronto's CNE grounds.